Hi, My wife and I had been talking about getting a puppy for some time. We had just purchased a house and finally had a yard for a dog. To boot, my son's day care provider just had a litter of 10 puppies... the timing was perfect. I knew the Mom and Dad and they both had great personalities. We picked one out at 3 weeks old but then went back again at 4 weeks with some friends so they could pick one out. After seeing them play a little more we changed our mind and picked the 2nd most rambunctious one of the litter… it was hard to change our minds, but it was certainly the right choice for us. We decided to make it a Christmas surprise for my son. We picked the puppy up 2 weeks before Christmas (2009) at 8 weeks old, knowing we would not get our son until the day after Christmas. The night we brought the then un-named puppy home he was retrieving, playing Frisbee (although he is not fast enough to catch it yet), eating, sleeping all night in his kennel, and all things you want out of a Puppy. He scared the day lights out of me one afternoon when he “supermaned” off the 2 foot retaining wall in our back yard after the Frisbee I was walking by with and hurt his back leg. Long story short, he got to go to work with Daddy and got a lot of leg massages that afternoon. He was 100% in a few hours. 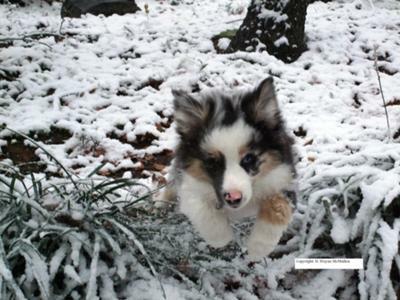 Our friends had named their puppy (from the same litter) Ranger and we were still up in the air about ours. After seeing his personality for a few days we settled on Mountie. Wow does that name fit! Mountie loves to play outside on his own and still thinks he is the boss of the house (at 12 weeks LOL). When our son got Mountie for Christmas he decided then and there they are best friends :) I couldn't have been happier. Mountie does tend to Herd our son up (and me) for no reason, but that is expected. Comments for Mountie, Please Meet The World! Mountie is now catching the ball in mid air! We have not gotten to the frisbee throw catch yet. But we are so proud! Cathy ask about how to get your puppy to catch the ball. I am assuming you are talking about a puppy around the same age as Mountie , my suggestion is just have fun fun fun and do not push the issue, he will come around soon enough same with Frisbee and all other games just have fun now and always and it will come around for sure. our aus Kai goes out in the snow and plows furrows with her nose sniffing after anybody's tracks. she ends up with a snoot ful of snow up to the eyes and looks happy as a dog could possibly be. I also got a puppy for Christmas and although he plays fetch he is unable to "catch" the ball. Any ideas on how to teach him to "catch". Gorgeous Puppy ya got there! Great choice for your little one!